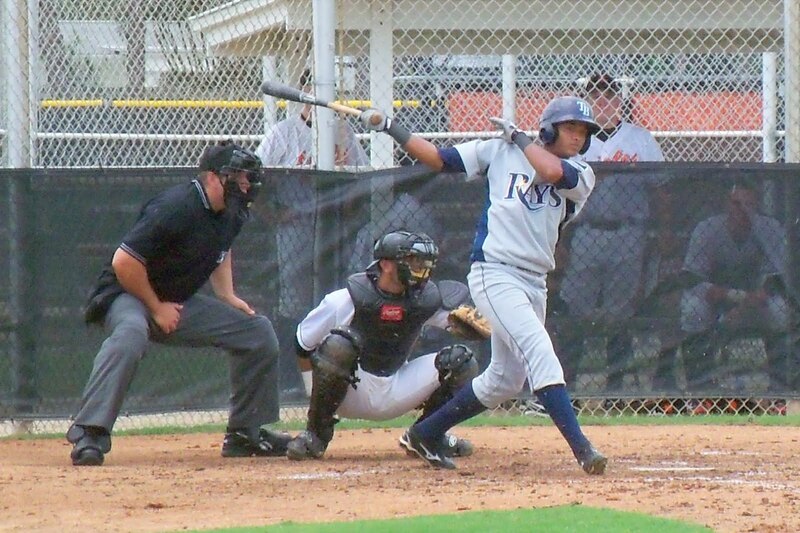 The Gulf Coast Rays defeated the Gulf Coast Orioles 3-2 on a dreary Friday afternoon in Sarasota. The light rainy condition could not keep Julian Morillo from scoring as he accounted for all three of the Rays runs. The Rays scored first in the third inning. Morillo drew a walk to lead off the inning. Morillo advanced to second on a ground ball by Cristian Vasquez then later scored on an RBI single by Joel Caminero to take a 1-0 lead. The Rays scored again in the seventh inning. Morillo let things of with a single to center. Morillo advanced to second on a wild pitch and then to third on an error. Edward Dorville plated the run with a sac fly to increase the lead to 2-0. The Orioles fought back to tie the game in the bottom of the seventh. Jonathan Schoop and Preston Hale delivered back to back singles to lead off the inning. Then Xavier Lopez drove them home with a two run double to tie the game. The Rays pushed across the winning run in the top of the ninth inning. Morillo and Vasquez drew walks to lead off the inning. Morillo would then score on a Dorville stolen base, winning the game for the Rays 3-2. Tyree Hayes made his third rehab appearance, pitching 3 scoreless innings allowing only 1 hit with a strikeout and a walk. Jose Molina earned the win, pitching 5 innings and allowing 2 runs on 3 hits with 5 strikeouts. Shane Minks picked up the save with a no-hit ninth inning. The Rays return home to Port Charlotte for another game against the Orioles on Saturday.